Owner, Steve works the front of the house taking orders and going in and out of the kitchen. The space is decorated with Thai art and has an place for burning incenses offering of oranges and a large laughing Buddha. The space is large and can be cool in the winter. Plan ahead and take an extra layer. The Phuket Cafe has a lot of vegetarian options and they are family friendly. 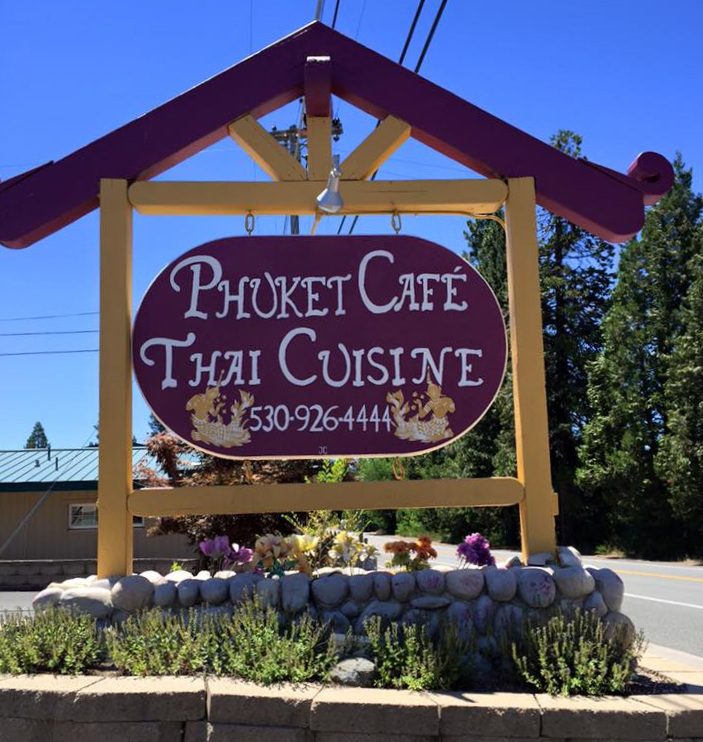 The restaurant’s name comes from Phuket one of the southern provinces of Thailand and Thailand's largest island. Phuket is a popular tourist spot world renowned for its white sand beaches, palm trees and lively towns. The island lies off the west coast of Thailand in the Andaman Sea. The island has a multicultural history Europeans (Dutch, Portuguese, French and British) in the 16th century with Chinese immigrating in the 19th century. I ordered the Karee, Yellow Thai Curry, with chicken. When ordering off the lunch menu you get a smaller portion and the rice comes on the same plate. I still took home a small box for dinner. Karee is yellow curry with coconut milk served with potatoes, carrots and topped with fried onions. The potatoes and carrots were perfectly cooked! The curry had the right amount of heat for me. This kind of heat that hits the back of your throat and feels warm. Having my mouth set on fire isn’t important to me. I like to taste the flavors and enjoy the meal. This dish was just right for me…rich and flavorful. Pad Thai is a traditional meal in Thailand and can be found on almost every Thai restaurant. It’s a good item to test the quality of a Thai restaurant’s flavors. Pad Thai is made with soaked dried rice noodles, chopped scrambled eggs and is flavored with a tamarind, fish sauce, dried shrimp, garlic or shallots, red chili pepper and palm sugar sauce and served with wedges of lime and chopped roasted peanuts. Most restaurants offer your choice of protein; tofu, shrimp, chicken or pork. It may contain vegetables like bean sprouts or green onions. Shelly ordered the Pad Thai with chicken off the lunch menu. The lunch portion is smaller and it’s served with white rice on the same plate. The Phuket Cafe’s Pad Thai has good flavors in the sauce and it’s not too sweet. The menu says they adds eggs, sweet radishes, beansprouts and tops the dishes with green onions. The menu said peanuts, but she didn’t get any on this dish. She didn’t get any radishes, either? They are accommodating so I think you could ask for them. The lunch menu is available at the cafe.